U.S. health care costs have gotten so outrageous that some small employers save money by flying workers to foreign countries for inexpensive medical procedures. (FSB Magazine) -- Steve Chavez is willing to go to extremes to combat rising health care costs. The president of Integrated Control Systems, a 180-employee Albuquerque construction firm, Chavez has watched costs for his workers' orthopedic claims - damaged rotator cuffs, etc. - soar over the past three years. Health insurance premiums for Integrated (icsicontrols.com) jumped 32 percent last year, bloating its overhead by 12 percent. That's why, starting this spring, Chavez is taking drastic measures, encouraging workers in need of major medical procedures to seek care in such far-flung locales as Costa Rica, India and Singapore - a growing practice known as medical tourism. Chavez estimates that overseas treatment will cut his medical costs by more than 10 percent year over year and help him avoid "another 20 to 30 percent rise in premiums." Where U.S. patients are going, and for what specialty. Until recently, medical tourists were mostly individuals seeking low-priced cosmetic and elective surgery not covered by insurance. But more than one million Americans will travel overseas for procedures this year, and a rising proportion are getting insurers or employers to pay part of the cost. It's easy to see the appeal for a cash-strapped employer. Surgery overseas costs 30 to 80 percent less than it does in the U.S., thanks to lower fees for even top-quality doctors and hospitals. The average charge for a coronary artery bypass is about $75,500 in the U.S., vs. $11,400 (including roundtrip airfare) at the Fortis Mohali hospital in India. A knee replacement in Singapore runs about $17,800 - roughly half the typical U.S. price. While global medical tourism has yet to make major inroads with U.S. employers, some small employers and benefit providers such as BlueCross BlueShield of Texas (bcbstx.com) are starting to take the idea seriously. As FSB went to press, benefits providers, employers and health care executives were scheduled to meet in Las Vegas on April 30 at the industry's first trade show. "Medical tourism is starting to take off in the U.S.," said Senator Herbert Kohl (D-Wisconsin) at a recent hearing. Experts predict that the medical tourism industry will grow to $40 billion by 2010. There is, of course, a huge stumbling block to growth: convincing workers to fly 12 hours or more to have surgery. That's where GlobalChoice healthcare (globalchoicehealthcare.com), an Albuquerque firm that helps connect U.S. employers and patients with foreign physicians, comes in. The firm, which is actively courting business owners, finds hospitals, sends records and schedules surgeries. It acts as a concierge, arranging air travel, hotel reservations and even sightseeing excursions. But perhaps most important, it aims to reassure patients that they will receive quality care. GlobalChoice uses providers in India, Mexico and Singapore, and screens doctors to make sure they speak English and were trained in Europe or the U.S. It works only with hospitals that have received accreditation from the Joint Commission International (jointcommissioninternational.com), a subsidiary of the group that screens U.S. clinics and hospitals. "Quality overseas can be much better than it is at home," says Jeffrey Seders, an insurance broker in Los Gatos, Calif., who works with GlobalChoice. "There are hospitals within driving distance that I wouldn't go in." GlobalChoice serves small and midsized companies in two ways. Self-insured firms deal directly with GlobalChoice to arrange employees' travel and treatments. Other employers use GlobalChoice through their health insurers. Either way, GlobalChoice charges a per-employee, per-month fee, much like a health-insurance premium. Employees might be responsible for a co-pay or deductible, depending on their health plan. 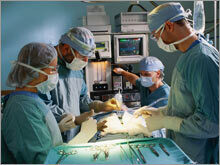 GlobalChoice then covers all medical and travel expenses for an overseas surgical procedure. So far GlobalChoice has signed up two providers, including McKee Benefits Service (mckee-enrollment.com), says CEO Ken Erickson. Erickson, 45, launched the company in 2005, catering to early retirees for whom Medicare coverage had not yet kicked in. To expand, he is also targeting self-insured companies such as Integrated Control that can barely afford benefits for workers. "Seeking treatment overseas may mean the difference between offering health insurance or offering no benefits at all," says Erickson. A handful of other U.S. firms, including IndUShealth (indushealth.com) and PlanetHospital (planethospital.com), arrange medical trips, but GlobalChoice is the first to target businesses. Not everybody is welcoming medical tourism. Last year Blue Ridge Paper Products, a self-insured firm in Canton, N.C., was set to send one of its employees to India for rotator cuff and gall bladder surgery. The United Steelworkers union intervened, sending letters of protest to the Senate and House committees with jurisdiction over health care. Employees "are now being confronted with proposals to literally export themselves," the letter read. Blue Ridge canceled its plans. Hoping to avoid that kind of conflict, Chavez will continue to provide some domestic coverage for doctor visits, including post-surgical care. At Integrated Control, employees now pay 50 percent of the cost of major medical procedures performed in the U.S. and 25 percent for those done overseas. "Once a few daring souls try it and everything turns out all right, other employees will embrace the idea," says Chavez. To that end, he is willing to be a guinea pig. "I need my rotator cuff done," he says, "so I'll probably go first." Would you travel to a foreign country to have surgery? Do you feel that employers should encourage medical tourism? Let us know. To give feedback, please write to fsb_mail@timeinc.com.